Using the TinyD6 engine, this is the latest iteration of the popular minimalist roleplaying game originally designed by Smoking Salamander. 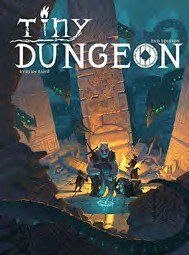 This version has over a dozen settings to run the players through and is useful as a game in itself or as a quick jumping off point for an existing campaign. 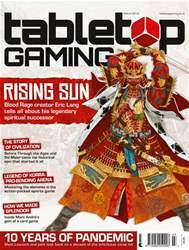 Dive into March’s issue of Tabletop Gaming read our whopping exclusive interview with Blood Rage mastermind Eric Lang about his next legendary strategy game, the incredible Rising Sun. You won’t want to miss it! As Pandemic turns 10 years old, we catch up with series creator Matt Leacock and some of the designers, artists and publishers that helped bring the groundbreaking co-op hit to life, hearing how a simple idea became one of the biggest board games of all time. Also taking a look back is Francis Tresham, the inventor of original empire-building epic Civilization. In a rare interview, he tells us about turning his fascination with history into a brand new genre and the lasting legacy of the game almost four decades on. The next instalment in our ever-popular How We Made feature meets up with Splendor designer Marc André to peek behind-the-scenes of his chip-collecting gem, discovering how his childhood hatred of chess and love of maths inspired one of the most absorbing card games in years. There’s plenty more to discover inside the latest issue of Tabletop Gaming, from tips on taking a board game holiday and a look at Legend of Korra sports game Pro-Bending Arena to new columns diving deep into indie games you might’ve missed and the history of the tabletop’s most influential mechanics. Not to mention our regular buffet of hobby tips, designer interviews and more. Of course, there’s no shortage of reviews, either – this month we give our definitive thoughts on Dinosaur Island, Escape the Dark Castle, Altiplano, Transatlantic, Favelas, Dungeon Draft, Kitchen Rush, Elite: Dangerous RPG, Empires, Nusfjord, Time Barons, Coaster Park and many, many more.